Concerned about the family constantly overriding your thermostat settings and turning up the heat over the holidays? Well, worry no more. Get the holiday comfort your whole family wants while you save energy and money with an ENERGY STAR certified smart thermostat. Save for your family. For the average American household, almost half of the annual energy bill goes to heating and cooling – more than $900 a year. A greener planet. If everyone used an ENERGY STAR certified smart thermostat, savings would grow to 56 trillion BTUs of energy and $740 million dollars per year, offsetting 13 billion pounds of annual greenhouse gas emissions. Choose smart. Only thermostats that have earned the ENERGY STAR deliver what you expect from a smart thermostat: including demonstrated energy savings and environmental benefits as well as reliable performance and convenience, insight and control. ENERGY STAR is the smart choice made simple. Click the logo below to find deals from our featured partner. 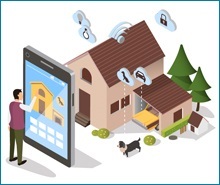 Interested in automating your home but wondering where to start? Let us help you navigate the smart home landscape so you save energy, save money, and help protect the environment. ENERGY STAR partners sponsor rebates on certified products. Join us in making a difference for your loved ones and the planet with ENERGY STAR gift-giving this season. Take the pledge to give great gifts. Encourage others to give the best gifts that do great things. Share this holiday badge on social media to spread the word and inspire others. Giving the great gift of ENERGY STAR this holiday season? Click here to print this gift tag to let your loved ones know.